Oaklawn Park last week dedicated its new winner's circle to Larry Snyder, a fitting gesture in that few people spent more time in the track's previous enclosure. One of horse racing's most successful jockeys and later one of its most respected officials, Snyder died Monday after battling cancer. An Ohio-born dynamo whom many Oaklawn fans knew simply as "Snyder the Rider," he was 76. Snyder spent 35 years in the saddle, posting 6,388 career victories and leading the nation in races won with 352 in 1969. On April 1, 1969, Snyder became the first jockey to win six races on a single card at Oaklawn. He tied the Louisiana Downs record with five winners Aug. 17, 1981. Snyder won eight riding titles and 1,248 recorded races at Oaklawn, where he served proudly as a steward from 1995-2017. Snyder was known for hustling horses out of the gate, although no less esteemed subject than Hall of Fame trainer Jack Van Berg said Snyder could do everything necessary on a horse. His biggest Oaklawn victories included the 1983 Rebel Stakes on Sunny's Halo, who would win the Arkansas Derby and Kentucky Derby in his next two starts, and the 1989 Arkansas Derby on Dansil, whom he would pilot to a fourth-place finish in both the Kentucky Derby and Preakness. He also won the 1969 Apple Blossom Handicap on Jay Roam and the 1970 Oaklawn Handicap on Charlie Jr.
Other of his major Oaklawn victories included three each in the Razorback Handicap, Count Fleet Sprint Handicap, Rebel Stakes and Southwest Stakes. Snyder's passing follows that of two other Oaklawn icons within the past year, track president Charles J. Cella and Van Berg. Although absent from the stewards' stand and in declining health, Snyder made an occasional visit to the Oaklawn press box during the 2018 racing season, shaking hands as always and boosting spirits. 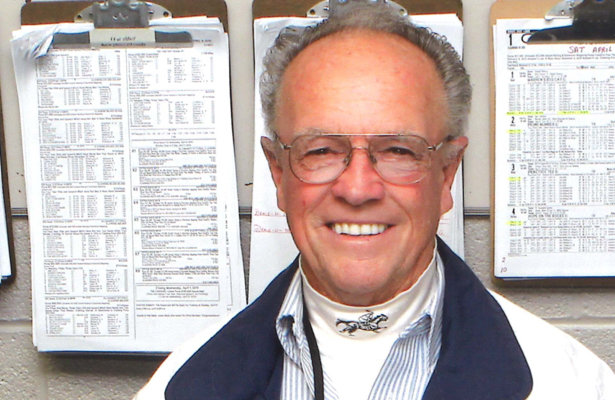 "Larry was a very beloved member of the Oaklawn family," said Louis Cella, succeeding his father as track president. "We were all happy that we were able to honor him with the new winner's circle before he passed. It was a very proud moment in Oaklawn's history (that) we are able to recognize someone who played an important part of our past with something that will begin a wonderful new tradition at Oaklawn." While winless in the Triple Crown races and Breeders' Cup, Snyder was much in demand nationally for major races at his peak. He became only the sixth rider in U.S. racing history to reach 6,000 career victories at Louisiana Downs Aug. 24, 1989. That same year, Snyder's peers honored him with the George Woolf Memorial Jockey Award for demonstrating high standards of personal and professional conduct, both on and off the track. Snyder retired in 1994 with career earnings of $47,207,289, still ranking 14th among North American jockeys in races won 24 years after his retirement. "In my 40 years at Oaklawn, I don't know if I worked with anyone with more integrity than Larry Snyder," said Senior Vice President Eric Jackson. "He lived his life the same way on the track as he did off it. Larry will be greatly missed." While still an active rider in 1988, Snyder was inducted to the Arkansas Sports Hall of Fame and during retirement, in 2001, was recognized by the Arkansas Walk of Fame in Hot Springs. In 1999, he was inducted into the Fair Grounds Racing Hall of Fame in New Orleans. In what to some is an egregious oversight, Snyder has been denied membership to the National Museum of Racing and Hall of Fame in Saratoga Springs, N.Y.
"We're working on that," says Oaklawn media relations director Jennifer Hoyt, including letters and other admonitions to racing celebrities such as Hall of Famers Gary Stevens and Wayne Lukas. Snyder is survived by wife Jeanette, renowned for her jockey silks, and son Larry Jr. He was preceded in death by daughter Lynette.